Description: Lessons follows Benjamin's hugely successful second opera, Written on Skin (02P096, 08P081) in tackling a distantly historical subject churning with the insatiable thirst for power, eroticism, and brutality. In this case, the story is that of the unsatisfactory, short and tragic reign of King Edward II of England (1284 - 1327) - the one whose manner of death has enthralled and horrified many generations of schoolboys in history class - and sets a libretto by Benjamin's previous collaborator, Martin Crimp, which adapts and condenses Christopher Marlowe's 1592 play. Of necessity for operatic purposes, the extensive political intrigue and many characters of Marlowe's account are highly condensed, and the opera concentrates on the vicious, manipulative interplay between the five main characters; the 'lessons' of the title being those well taught and ably learned by the king's teenage son and heir. The king's homosexual relationship with his arrogant and powerful favourite, Gaveston, is, as in Marlowe, a pivotal issue, as is the struggle for power between the king, the scorned queen, and the nobles, who despised Gaveston (and he, them) - and ultimately its devolution onto Edward III. The composer describes the opera as a 'vortex' that draws the characters and the audience into a suffocating, inescapable cycle of hatred and violence, and this aptly suggests the work's unrelenting intensity. Of note is the way in which, rather than graphically displaying much of the horrific consequences of the principal characters' actions, their incessant cruelty and their torment at their own hands and one another's, the music underlines their dialogue and descriptions of events with a counterpoint of seething discord. Benjamin's idiom is harmonically lush, with a palpable though remote relationship with tonal harmony and, as always, an exquisite sense of tone color that lead to some truly memorable illumination of the drama by timbral means - sinister rattlings and ticking, and the suddenly alien sound of the cimbalom at key moments. The ambiguously modern dress production, with sparse, gigantic sets arranged with a painterly eye for composition and detail, matches the magnificence and claustrophobic inevitability of the narrative. 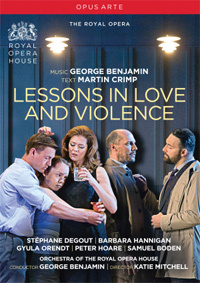 Stephane Degout, Gyula Orendt (baritones), Barbara Hannigan (soprano), Peter Hoare (tenor), Orchestra of the Royal Opera House; George Benjamin. 16:9 wide-screen. DTS Digital Surround or 2.0 PCM stereo. NTSC all regions. 88 min. + 5 min. extras.